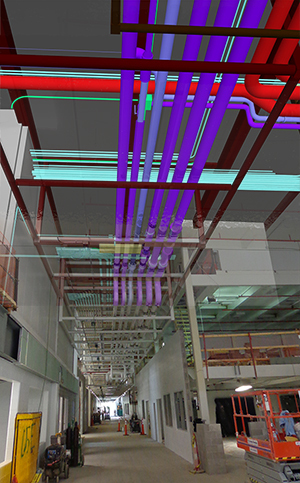 BIM (Building Information Model) and VD+C (Virtual Design and Construction) have become industry buzzwords that have many different meanings depending upon who you ask. This, I find, is mostly due to the perception and expectations of our clients. Some have had bad experiences in the past, which can lead to hesitations in fully adopting BIM on future projects. To combat this, it is important to convey to the client what CRB’s BIM/VDC workflows are, and more importantly, how they fit into this process. Client involvement is critical for any project to be successful. One huge advantage of BIM/VDC is giving our clients a model fly-through of a new building or retrofit using Navisworks. CRB is able to review design elements, such as accessibility and spatial arrangements of equipment. Though this is a standard practice for a lot firms, CRB has incorporated minor changes into this workflow to promote more client involvement. CRB uses colors to convey a reviewed space so time is not wasted going over areas and/or systems that have been reviewed and approved in previous meetings. For example, last week we met with a client and reviewed a WFI loop and it was approved. Fast forward to this week’s model review meeting. As we’re flying through the model, all WFI piping will appear green in the model, indicating it has been reviewed and approved. Now to take it a step further, let’s assume it’s a ONEsolution project. The color red can be used on that WFI piping to indicate that it has been released for fabrication. This will alleviate last minute changes from the client or convey cost implications of these changes. Not only do we have the ability to review the model with our clients, we can also give them access to the model using Assemble, a cost estimating tool that doubles as a model viewer, at no cost to our Clients. Assemble’s primary use is with our Construction group as a Quantity Take Off (QTO) tool, but can also be utilized as a web-based model browser. The client needs no software to view the model, they simply need an internet connection. These are the conversations that need to be happening at the beginning of the project. Client involvement is key. It’s time to think outside the box and start using BIM to its full potential in a practical manner in order to drive client decisions. *This is the first in a series of Practical Approach to BIM CRBlog posts.